Whether you are a full-time carpenter or an occasional DIY enthusiast, making sure that you have the best quality tools will not only save you time and money but will also give you the best results. A cheap drill, for example, will result in insufficient torque and will be far more likely to blow up while a poor quality screwdriver will lead to threaded ends and the horrible task of having to drill out the embedded screw when you can’t unscrew it. Finding the top dado blade on the market is no easy task unless you are happy to buy them all so you can compare them yourself. Since this is expensive, it is obviously something that most people don’t want to waste the money to do. 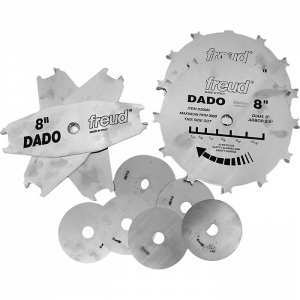 That is why we have done the work for you and reviewed all the dado blades to find out which one is really the best. 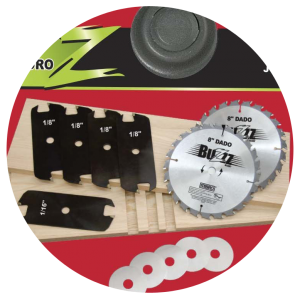 A dado blade is designed to be used with a saw bench that allows for wide cuts to be made in wood. 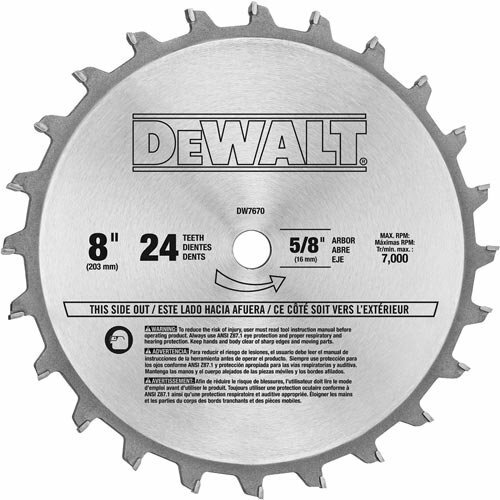 A normal saw blade will slice wood but won’t cut out any area larger than the blade width. In the past, woodworkers would cut two ‘channels’ in parallel into a piece of wood then use a chisel to hollow the center piece out. If you have ever done this, you will certainly know how time-consuming this process is, which is probably why you are now here looking for a dado blade. 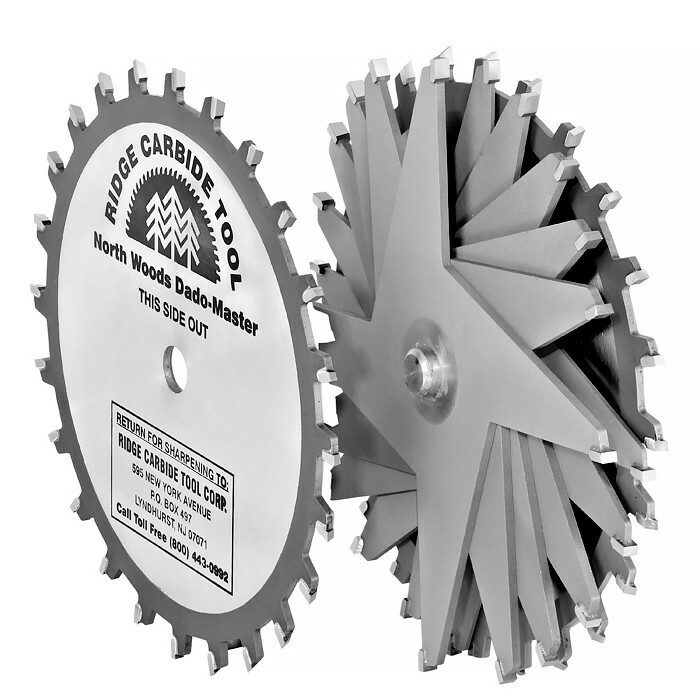 How does a dado blade work? It is a series of blades that are positioned together so that when they cut they create a channel or ‘dado’ in the wood. Two exterior blades make the wall cuts while in between these is a series of other blades or ‘chippers’ that carve out the internal channel. The design of these chippers varies quite a bit, but the overall function is the same, to remove the wood from the channel. The drawback with this type of blade is that it will only create a cut that is the width between the two exterior blades, so should you wish for different widths, you will need to spend the time to adjust it. Typically, this means taking the blade apart and adding or removing inner chippers and shims. For more information on how to cut the perfect dado, you can read this really helpful article. What are the different types of blades available? There are two main designs of blades available, the stacked dado blade and the wobble blade. This is by far the most popular type of blade used for cutting dadoes or rabbits. The reason for this is that the design offers a really good level of stability when cutting which obviously helps with the cut precision as well as helping with safety. Most blades range from 1/8 inches up to ¾ inches and are fully adjustable for different sized cuts. These types of blades that are otherwise known as adjustable dado’s use a different approach to create dadoes. 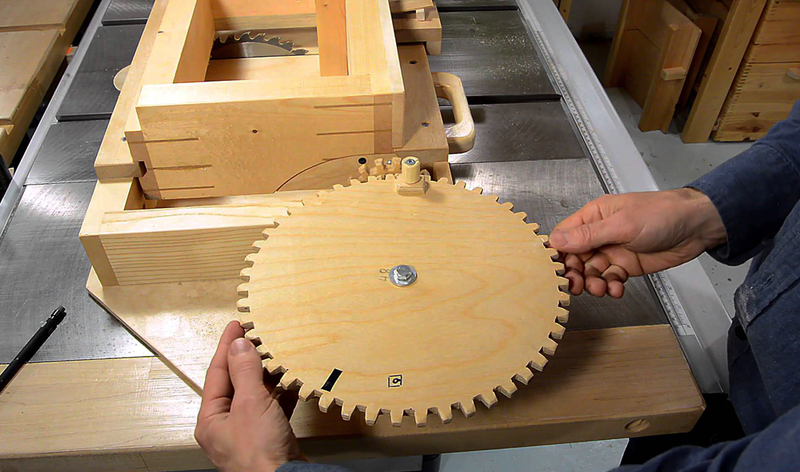 They are a singular circular blade that can be set up to adjustable angles which then ‘wobbles’ as it cuts the wood. This wobble allows the blade to cut out dadoes as it cuts back and forth across the wood. 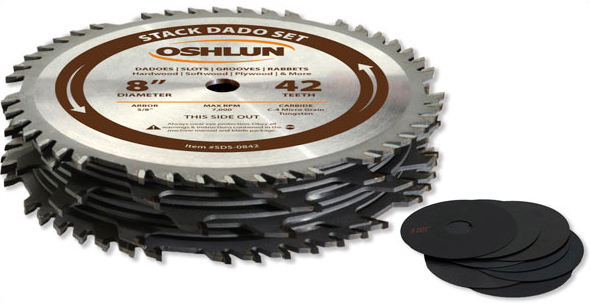 If you are looking for the cleanest cut, then you need to get the stacked dado blade. This is perhaps the reason for their popularity. Since the blade does not wobble but instead relies on the series of blades and chippers that cut straight into the wood, the end result is much better. The ‘wobble’ effect reduces overall precision and therefore does not yield as good results as the stacked dado design. Therefore, if you require a smooth and clean dado it is better to use the stacked dado design. Though the stacked dado design is simple enough to construct, it does require a lot more time and patience to do so particularly as you need to set it up for each new cut width. Therefore, there is no way it can possibly compete with the wobblers easy to use single blade design. 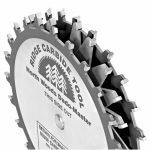 The advantage of the wobbler blade is that it is far easier to adjust and doesn’t come with the risk that you might not have put the blade back together properly. 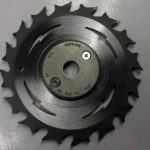 To increase the width of the cut, you only need to increase the angle of the blade in relation to the hub that it is connected to. Therefore, you don’t need to remove the blade which is firmly connected to the hub making this design much safer. Due to its design, a wobbler blade also allows you to make in-between normal size cuts, which is something you cannot do with the stacked dado design. This means that you can cut in-between the standard spacing and therefore make your cut width much finer. So for example, if 3/16 is not enough then with a good wobbler blade you could adjust it to another 1/64th to give you a more accurate cut width. All cutting blades have some degree of danger involved. To start with, you should always make 100% sure that you use the blade in accordance with the instructions. 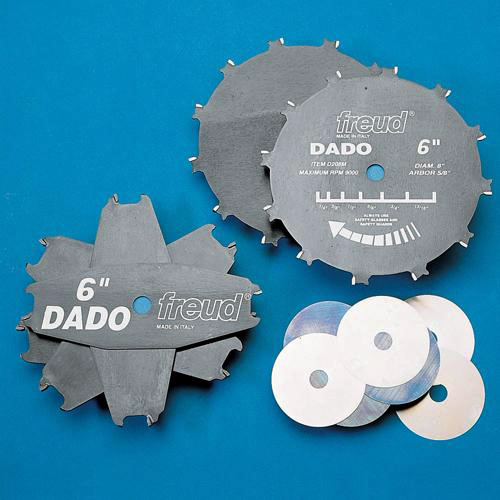 However, stacked dado blades are considered to be a little bit safer as they are more stable when cutting. They cut straight and are opposed to wobbling back and forth. When using a wobbler blade, you need to take special care with the speed at which you feed the wood to the blade both to prevent accidents and also to get the best cut. To decide on which blade type is best for you, you really need to consider if you are looking for the cleanest cut or for the most levels of adjustability. If the cleanest dado cut is most important then get the stacked blade whereas if it is adjustability, then buy the wobbler design. We have included below a quick recap of the pros and cons of the two different types of blades. What to keep an eye out for when trying to buy the best blade. There are 2 main things to focus on when buying any blade, design and quality. Though most of the better dado blades aren’t exactly cheap, you can expect them to last quite some time. This means with the more expensive designs you will definitely get your money’s worth as long as you take care of them and do your best to avoid old bits of wood that might have nails in them. As far as design goes, it is worth doing your homework to make sure that there are no repeating flaws that continually rear their ugly heads. 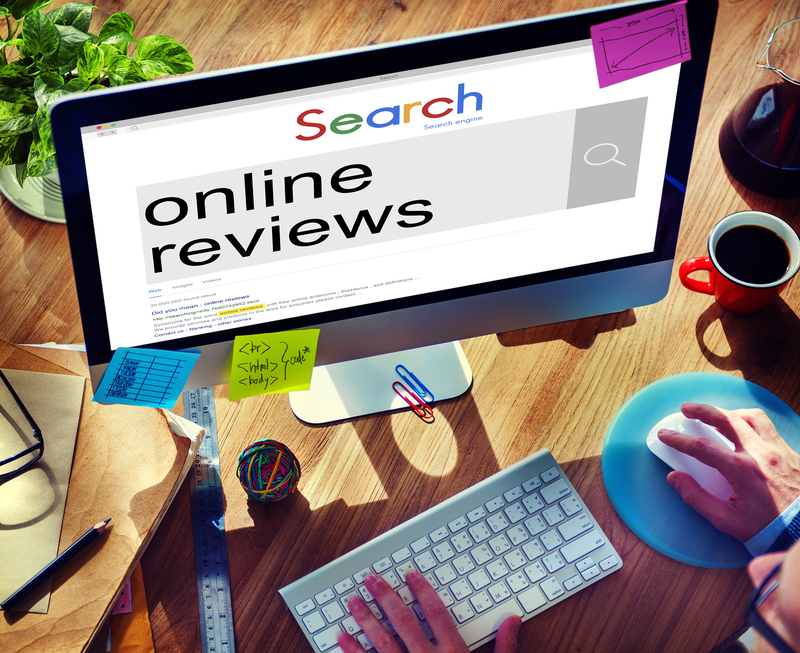 You can do this by reading plenty of customer feedback, which is available on all reputable online stores. When it comes to quality, we recommend that you avoid cheaper brands that have dubious reputations. Made in China is not a hallmark of poor quality as in fact most products are currently made there. Even if you buy a reputable brand, it is likely that the blade has been made in China, meaning that in fact this is not really an issue. Above all, we recommend that you do you research before you buy to ensure you are getting the top blade for your needs. 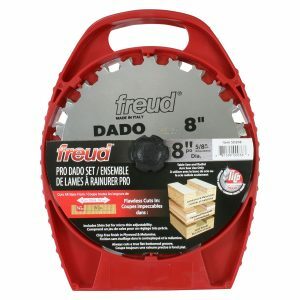 This blade is, without doubt, our top choice for all of you who need a great dado blade. It offers a really good level of cutting power on a range of different materials including hardwood, softwood, and even laminate. Freud make the blade out of their own unique highly compact titanium cobalt carbide to give it extra strength and durability. Not only does the titanium add strength but it also prevents the blade from rusting and so leaves it is always looking like new. As far as the cut goes, the internal chippers use a negative hook angle that helps to give a really smooth surface leaving you with very little work to tidy up. There certainly won’t be any nasty splinters or any unwanted grooves that you need to chisel out with this blade. 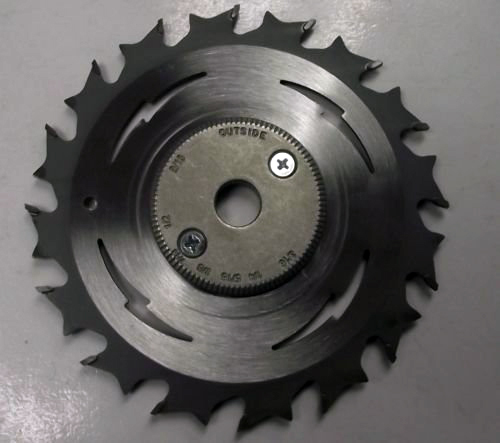 The blade is 8” in diameter and comes with 24 teeth on each blade. 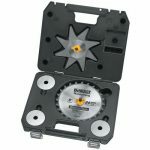 It is the standard 5/8-inch arbors design and is certified for use with spin speeds up to 8,000 RPM, which gives a higher level of precision and finish. It has been designed to resist kickback, which makes it a lot safer blade to use too. Should you wish to adjust the blade, it incorporates 3 different two wing chippers, including one 3- 1/8″ chipper and 3- 1/16″ a spacer, which gives a really handy minimum possible adjustment of 1/16 inches. The blade comes with a really helpful shim set to help with all those tiny adjustments that you might need to make also. This is a really great blade that will certainly give you plenty of cutting power. Should the 8” blade might be a little too big for your table then it is also available in a 6” size. Made in Italy, this laser cut blade is crafted to the finest possible quality. All the blades and clippers have a heat resistant non-stick outer coating that makes for a smoother cutting experience even when the blade gets really hot. This blade can cut grooves from 1/4-Inch to 7/8-Inch and can be used with softwoods, hardwoods, plywood, and melamine. Some people have even reported using it to cut 28-gauge metal roofing with no trouble at all though this is not recommended by the manufacturer. The 2 outer blades have 12 teeth a piece, while the set includes 3 chippers, 3 spacers and 7 shims ranging from 0.004” to 0.02”. As a result, this set offers a good level of adjustability and effective cutting power. What’s more, the teeth can be re-sharpened to give this great blade set a much longer life. The DEWALT DW7670 has impressive 24 micro-grain carbide teeth that deliver a powerful and precise cut. Obviously, this helps to prevent splintered ends and rough cuts that will need a lot of tidying up after. The blades have a 5/8 inch arbor hole and have been laser cut to ensure the best possible quality. They blade set has a maximum cut of 29/32 inches. The set comes with 4 tooth clippers that are angled to -12 degrees to give a nice and smooth bottom cut while the stainless steel shims help give you the power to make very fine adjustments to the cut width. The blade set has been designed for use with most tables with a maximum speed of 7,000 RPM. 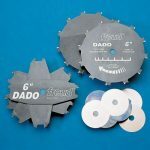 This great blade set is ideal for dado cuts, tenons, rabbet cuts with a range of different materials including hard and soft woods, plywood and melamine. The main advantage of this set over some of its competitors is that it comes with a 3/32 inch clipper which allows for smaller width adjustments. If you are someone who finds themselves needing this higher level of adjustment, then this set is definitely worth the extra money. This blade set is available in a 6 or 8-inch size and gives people who can’t fit an 8” blade the chance to still use this good quality design. The 8” blade has incredible 42 precision ground C-4 micro grain tungsten carbide teeth, which really do make this blade the option for all those woodworkers who want the finest possible cut. In the right hands, the number of teeth on a blade can really make all the difference. With blades of equal build quality, the blade with the most teeth will give a finer cut that results in much fewer splinters. To help to prevent the wood from breaking up and making splinters, the blade has been designed to leave small scores on the outer edges. 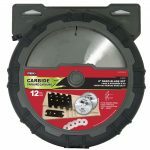 This 16-piece set comes with lots of 3/32-inch chipper and shims to give plenty of chance to make some big adjustments in terms of cut width. 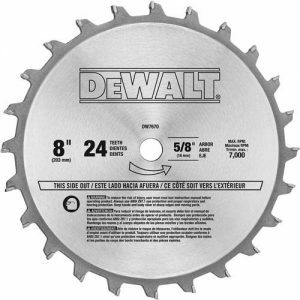 It can make cuts ranging from 1/4-Inches to 29/32-Inches and leaves both the edges and bottom feeling really smooth. 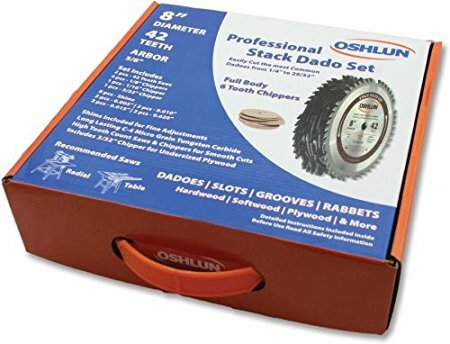 The set comes with a really good quality carry case that will prevent your set being exposed to the elements or damaged when improperly stored. The Ridge Carbide 8″ Dado Master is a really respectable blade set. 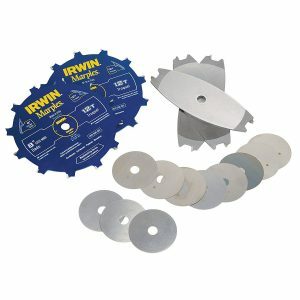 Ideal for any tradesman, it consists of a pair of outside dado blades, 3 tooth chippers, and a x4 shim set. The tooth chippers include a 5-degree negative hook 4 – 1/8″ x4, a 1/16″ tooth chipper x4, and a 1 3/32″ tooth chipper. These give plenty of flexibility to the user to get whatever cut they desire. 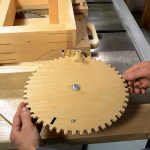 A really handy feature of this set is that it can be used on either a radial arm saw or a table saw. It is able to make cuts of all sizes, including being able to cut undersized plywood grooves of 15/32″ and 23/32″. 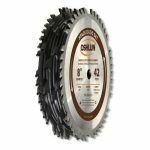 Its 24 heavy steel tooth saw configuration ensures that you get only the cleanest cuts on all kinds of hardwoods and softwoods. Its negative 5-degree face hook helps guarantee a splinter-free cut, even when cutting across the grain. The shim set lets you make very fine adjustments to the cut, something which makes this blade set ideal for cutting even the most delicate plywood’s. This is a great blade set that gives you all the power you will need to create the perfect cut every time. The set comes with a carry case and instruction booklet. Our final set is a great low-cost option for people who are only planning to use it occasionally. 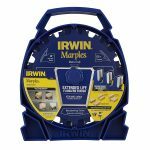 This 14-piece set is very reasonably priced and thanks to its great cutting power and good results, is our top choice blade when it comes to value for money. 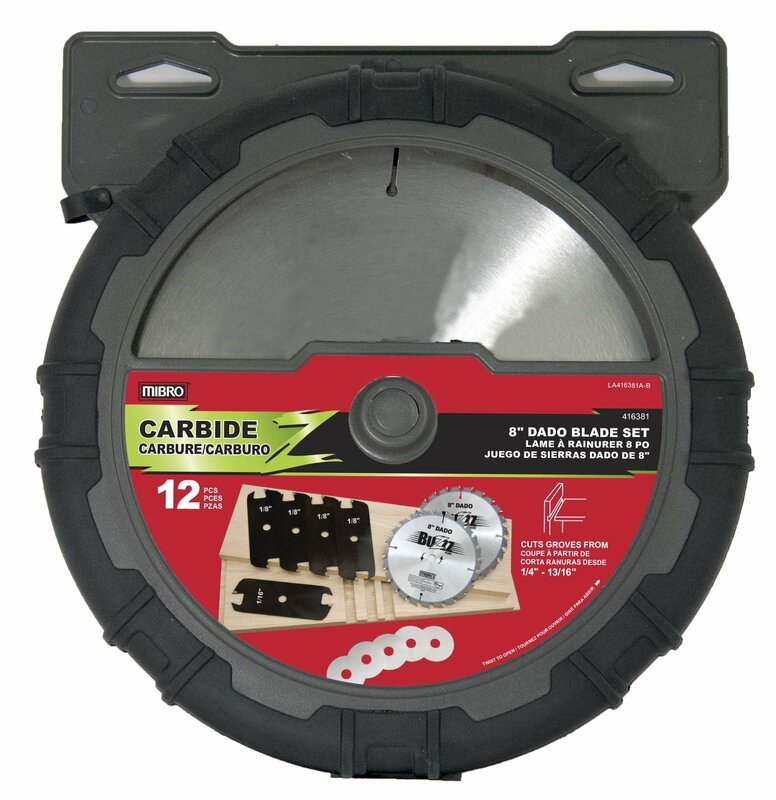 It is another carbide tip blade set that allows cuts of between 1/4″ to 13/16″. It allows for a good level of adjustment and cutting power thanks to its 4 1/8” and 1 1/16” twin tooth chippers. The set comes with 7 separate metal shims for fine adjustments and a handy carry case for transportation and storage. This is not perhaps the best choice for professionals as it doesn’t offer the cutting precision and adjustability of other sets, but for people on a budget, it is a great option as it is definitely a great blade set for the money. 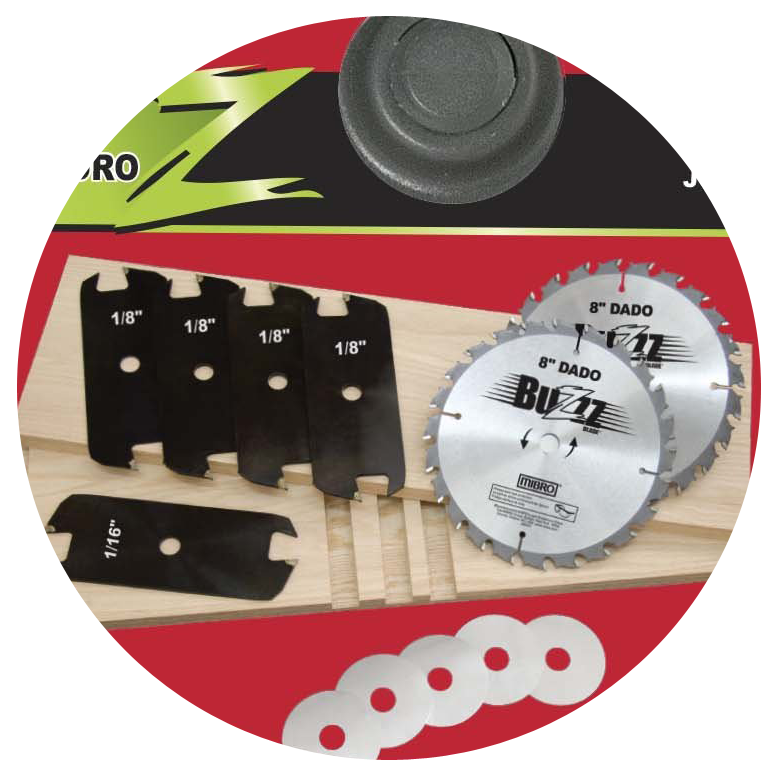 This set is ideal for the DIY enthusiast who doesn’t want to have to spend the earth to get a really respectable dado blade set. Getting the right tools and equipment is really important for all workers, no matter if it is a DIY enthusiast or a professional with years of experience under their belt. If it is true that as the saying goes that a bad workman blames his tools, then it also has to be true that a good workman must thank his tools. All the products on this list really are the top of their class and though some are quite different from others in terms of price, intended use, and suitability for certain tasks, they are all excellent in their own way. Finally, a quick reminder to be sure to remember to take extreme care when setting up your dado blade set so as to avoid any accidents. For a great article that explains how to do this safely and how to look after you can read more here: table-saw-guide.com/dado-blade.html.